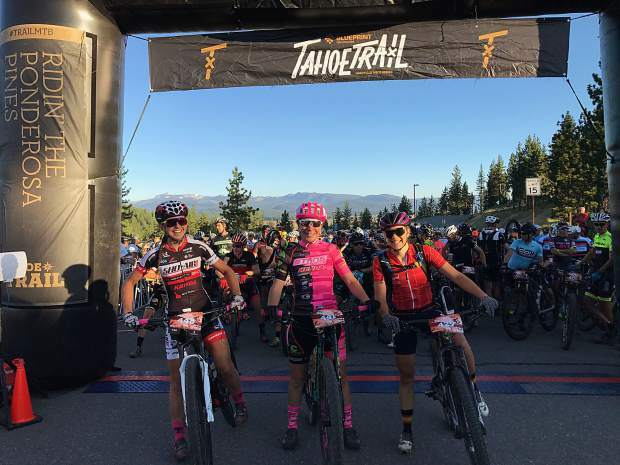 This year's Tahoe Trail MTB 100-kilometer race was stacked with professional talent on the women's side. Larissa Connors (left) won this year's race. Jennifer Smith (middle) was third place at the 2016 Leadville 100 MTB, and Caitlin Bernstein was last year's Tahoe Trail winner. Nearly 500 competitors came out on Saturday, July 15, to battle it out in the seventh annual Blueprint for Athletes Tahoe Trail Mountain Bike race. 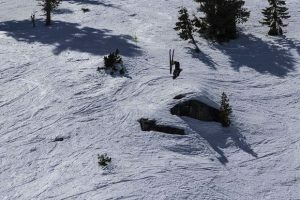 The riders took to the start at Northstar California Resort to compete in either a 50-kilometer or 100-kilometer race, which took place on a 50-kilometer loop between Northstar and Tahoe City. The 100-kilometer course featured seven climbs with over 2,000 feet of elevation change. According to race organizer Josh Colley of Youphoria Productions, this year’s race marked one of the largest turnouts since the event’s inception in 2011. The depth of the women’s division highlighted this year’s race with several professional cyclists taking on the course. 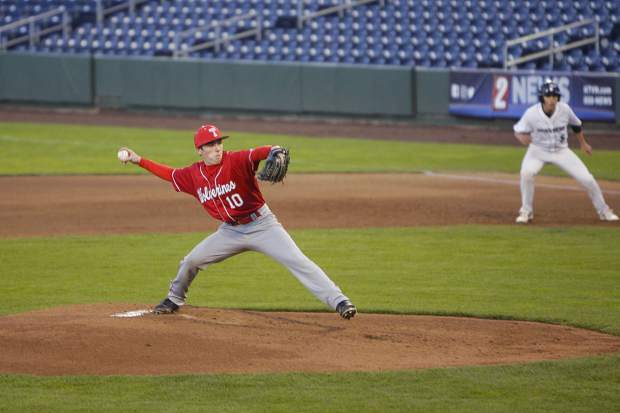 “This year was huge for the ladies,” Colley said. The field of professional females included notable cyclists Larissa Connors of Silverado, Calif., Julie Young from Auburn, Caitlin Bernstein from Oakland, who won last year’s Tahoe Traill 100, Laura Spencer of San Anselmo, Calif., and Jennifer Smith from Gunnison, Colo., who finished in third place at last year’s Leadville Trail 100 MTB. In the end it would be Connors taking a dominant win, finishing over 20 minutes faster than her nearest competitor, Candice Corder from El Cerrito, Calif., with a time of 4:38:52. Connors came into the race two days after learning her grandmother had a tumor in her lung and cancer in her lymph nodes, according to Connors’ website, and dedicated her performance over the 100-kilometer race to her grandmother. The top local female was Sian Turner Crespo out of Truckee with ninth-place overall, and second out of the 30- to 39-year-old age group with a time of 5:51:36. On the men’s side, Peter Stetina out of Santa Rosa, Calif., picked up the win in the 100-kilometer race. Stetina, a 29-year-old professional road cyclist, swapped out his road tires for knobby ones to finish first out of the 360 competitors with a time of 4 hours, 5 minutes, 23 seconds. Jamey Watson-Yanki out of Boise, Idaho, led for most of the race, but Stetina was able to make the pass on the final climb. Watson-Yanki held on for second place with a time of 4:09:19. 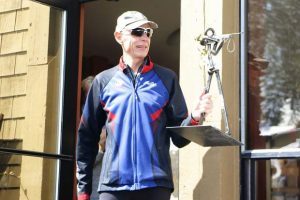 Truckee’s Troy Deibert was the top local finisher and took second in the men’s 40- to 49-year-old division with a time of 4:37:15. In the 50-kilometer race, James Pizzo out of Roseville captured first place with the 16-year-old rider topping Truckee’s Phillip Hynes by nearly 5 minutes for the win. Pizzo got through the 50-kilometer course with a time of 2:30:12, while Hynes finished with a time of 2:35:10. Julianne Silva out of Santa Maria, Calif., picked up the win on the women’s side, finishing with a time of 2:50:26. Debbie Hakansson out of Truckee was the top local female, finishing with a time of 3:14:40 for fifth-place overall, and second out of the women’s 50- to 59-year-old division. The race was put on by Colorado’s Youphoria Productions and served as a qualifier for the Leadville Trail 100 MTB in Colorado, which is the second oldest 100-mile mountain bike race in the United States. 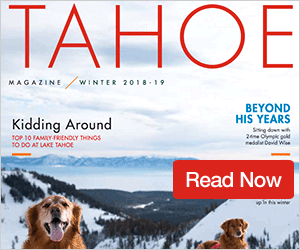 With so many riders vying for a spot in one of the most prestigious mountain bike races, Colley said the top finishers at the Tahoe Trail 100 receive some of the 75 available entries, with the rest of the qualifying times being put into a raffle. The race will be held on Aug. 21-22, and has been won in past years by notable cyclists, such as Lance Armstrong and Levi Leipheimer.